Wake up, are you suffering from 'Trump syndrome'? A Yale University physician says if your family and friends are concerned with your erratic behavior, you may have "Trump Syndrome." Donald Trump, of course, brags about how he only needs 3-4 hours of sleep a night. But does it explain the Republican presidential candidate's propensity for outbursts, lofty ideas and middle-of-the-night tweeting? Daniel Barron, M.D., Ph.D., and his colleagues have taken to discussing whether certain patients are suffering from the syndrome, what he calls "a ravenous late-night craving for stimulation that results in a sometimes sporadic, often slender sleep schedule." "Sleep deprivation is an area of intensive research. For millions of years, our brains evolved to work during the day, sleep at night. In most parts of the world, daylight lasts about 15 hours (depending on where you live), so there was no reason to have a brain that lasted much longer. That is, until the light bulb was invented. Research shows a litany of glaring and subtle effects, including degradation of memory, reaction time and recognition other people's emotions. So how much sleep is needed to keep the brain healthy? 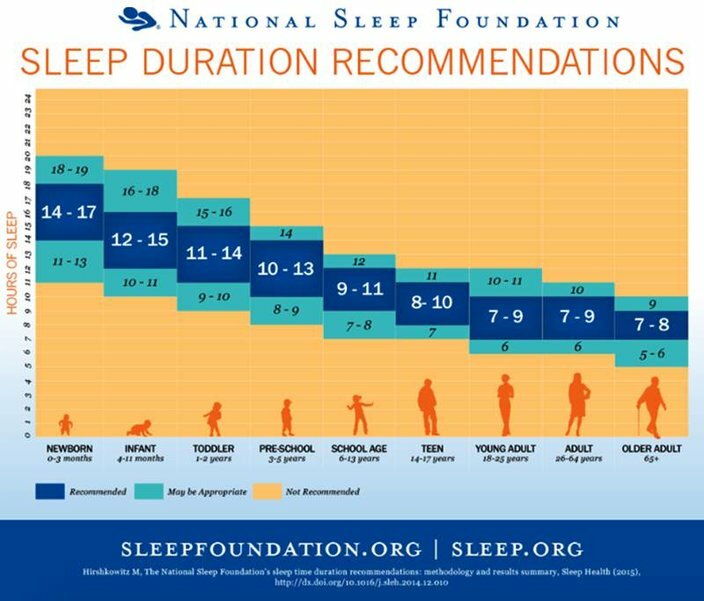 The following chart from the National Sleep Foundation includes recommended sleep duration for various ages.